Cam Crawford and Jody Hunt, Directors of Chillex Services, traveled down to Gisborne last week to inspect the new H.B. Williams Memorial Library. Chillex Services were very proud to be part of the mechanical services for this spectacular new building. One of the hottest days of the year in Gisborne (29c) the clients were beaming that their building were cooled to perfection and all their staff could not be happier with their new premises. Well done to the Chillex Team to another successful outcome and ensuring that our clients always remain cool and comfortable. 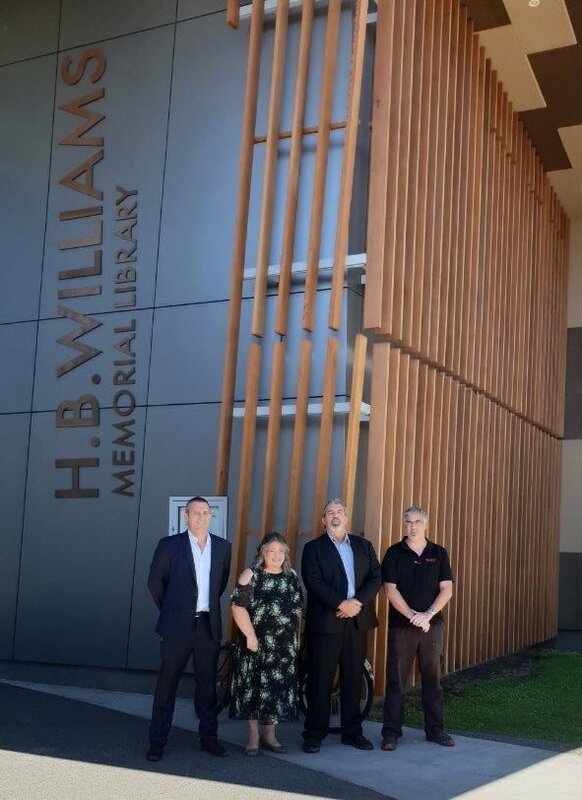 Cam Crawford and Jody Hunt, Directors of Chillex Services, traveled down to Gisborne last week to inspect the beautiful new Council Buildings that have been constructed. Chillex Services were involved with the mechanical services for the Council premises. One of the hottest days of the year in Gisborne (29c) the clients were beaming that their building was cooled to perfection and all their staff could not be happier with their new premises. Well done to the Chillex Team for keeping our clients cool and happy. The challenge was set down by A.E Smith for a head to head Go-Kart Challenge with the undefended Chillex Racing team which was held down at Hampton Downs. A big thank you to Gripple for organising and sponsoring this event between the two companies and for putting on a spectacular BBQ afterwards and a few cold ones. Everyone had a great day – especially the Chillex Team as we kicked A.E. Smith butts and won yet again the Go-Kart trophy. Bring it on again next year!! The Chillex Westfield team have been busy preparing for the first AHU to be installed on level 1. Reinforcements were required from the Chillex Services team to help out with the installation. Thanks to all the great team work the job went without a hitch. Only another 12 to go! Awesome work lads! Holyoake Industries Ltd put on a fantastic factory tour for 25 budding apprentices. Apprentices from 7 companies Chillex, Cool Comfort, Economech, Airmark, 1st Mechanical, Thermal Solutions and A.E. Smith Projects congregated at Holyoake’s factory last Thursday. Scott Holyoake was there in addition to Ewen and Karl. Everyone was provided afternoon tea, and all the boys got a backpack filled with goodies. What an excellent example of suppliers supporting the industry. Thank you Holyoake Industries. It all started on an early sunny Sunday morning – J. A. Russell Ltd’s annual poker run for their petrol head customers who want any excuse to take their V8 cars out for a blast around the country side. After a great cruise around the highlights of West Auckland and surrounding area we ended up at MOTAT where a fully catered lunch was waiting for us and of course one or two quiet ales. This year all money raised for this event went to Mercy Hospice in appreciation for all the wonderful work they do for the Auckland Community. .
“Thank you so much for joining together to help Mercy Hospice. We are very grateful to all of you for supporting our services by providing and installing a new air conditioning unit for our future Chapel (currently being used as office space). “The team using this space are now cosy and warm and this summer they will be able to throw away the portable fans and keep cool. We also realise that it was not the easiest of installations with the wiring having to travel up, in and around the ceiling but they made it look easy, were totally obliging and breezed through it with no fuss!! 100% Recommend!! This Kiwi crew headed over to Melbourne last week for another fantastic event put on by the Australian Mechanical Contractors Associations (AMCA), BIM-MEP AUS Construction Innovation 2018 Forum. BIM-MEP is an industry led initiative which serves as a touchstone for BIM innovations in our sector not just in Australia but globally. It was great to have the New Zealand contingent attend the Forum which gave us the opportunity to hear from Australian and international speakers to help build our own individual and organisational capacity as well as inspire new strategies and methodologies that can be embedded within business practices. This year Chillex Group are proud to be one of the sponsors for the NZIOB Charitable Trust Awards. This year’s event will be a Night at the Trots held at Alexandra Park on 21 September 2018. The NZIOB Charitable Trust Awards were established in 2017 by the New Zealand Institute of Building Charitable Trust to support worthy individual endeavors for the betterment of the construction industry. This very special event will assist in raising funds for the NZIOB Charitable Trust, whose purpose is to establish and award scholarships/prizes, and to fund research and innovation that relates to the construction industry. Another exciting helicopter lift for Chillex Maintenance. Eight VRF condenser units needed to be moved from an existing platform to a new modified cantilever platform on the adjacent wall. The most critical part of this project was disconnecting all systems on the Friday prior to the helicopter lift and then ensuring all systems were reconnected and back up and operating again on Monday morning ready for business as usual. Thanks to all the team involved with this project this was successfully accomplished 3 days ahead of schedule. Chillex Group are proud and excited to be part of the team that will be building Auckland’s $790 million Westfield Newmarket project, Scentre Group’s largest in Australasia. The Chillex team are primed and ready to start working their magic on the mechanical services for this new build. Watch this space for progress.